Social Networking Surges For Seniors Social networking has almost doubled among people older than 50 in the past year, with 42 percent of seniors participating in the hot Internet trend. Using Facebook and other sites, seniors build support networks that help them begin a second career, prepare for retirement or deal with health issues, a Pew report finds. 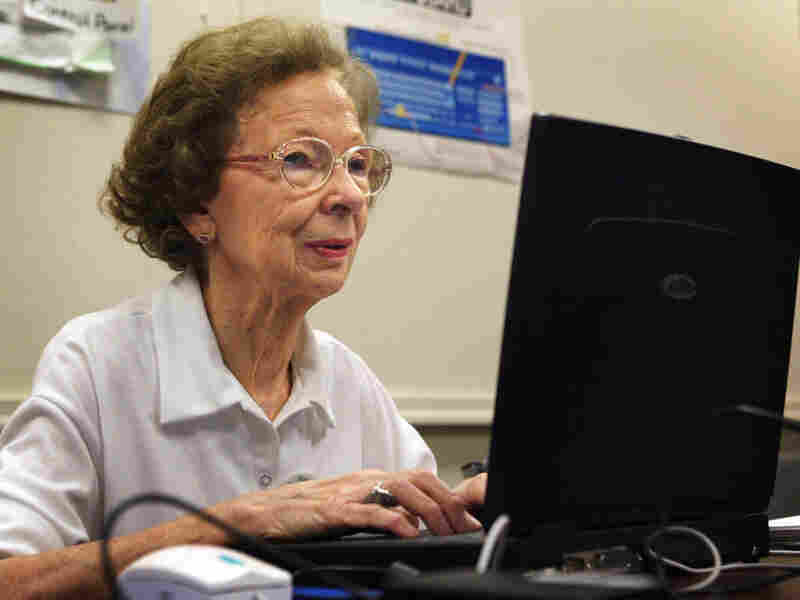 77-year-old Suzette D'Hooghe works on her laptop computer during a computer class in Des Plaines, Ill., in 2003. Increasing numbers of people older than 50 are turning to social networking to share updates and connect with family and friends. And more and more people ages 50 and older are joining social networks, according to a new report by the Pew Research Center's Internet & American Life Project. The study found that social networking has almost doubled among this population -- growing from 22 percent to 42 percent over the past year. "I've connected with friends and acquaintances that I have lost contact with through the years -- people I've graduated high school with and people from my hometown," says Claire LeSage, 63, who has been using Facebook for about a year-and-a-half. In addition to connecting with her nephews and a niece who live across the country, LeSage uses Facebook, LinkedIn, Twitter and Plaxo to run Wittz End, her relocation concierge service for baby boomers and seniors in Norton, Mass. There's been a dramatic increase in social networking over the past five years by people ages 50 and over. Older Americans are becoming increasingly computer literate, and that means they're also becoming more comfortable using the Internet. This has the potential to boost e-commerce, computer and gadget sales as well as subscriptions for high-speed Internet access among this population. The promise of social networking -- as a tool that can enable people to share photos, videos, links, contacts and status updates -- has some unique applications for senior Americans. "E-mail is still at the center of older adults' social communications," says Mary Madden, senior research specialist for the Pew Internet & American Life Project. But she says social networking is supplementing their daily communications, and once they start, they are using it more frequently. Most older adults have been introduced to social networking by their children, Madden says. This has the potential for strengthening family ties across generations. The appeal of social networking for older Americans may also be related to managing health issues. Blogging and contributing to online health forums or listservs are popular activities for some people coping with a serious illness. The Pew report found that people living with a chronic disease are more likely to reach out for support online. Tammy Gordon, AARP's senior adviser for social communications, says a quarter of the organization's members are using Facebook, and the number is rising quickly. Nearly 19 million people ages 55 and over used Facebook in July, up from about 9 million one year ago, according to comScore. "Because many of them are new to social networks, they are more apt to fall prey to scams," Gordon says. "We alert them to ones that are making the rounds, but we also encourage everyone to get familiar with privacy settings." Twitter use has also grown. Ten percent of Internet users over 50 say they're using Twitter or other status update services, according to Pew. Despite the rise in social networking activities, Pew's research found that seniors over 65 are among those least likely to have high-speed Internet access at home -- less than one-third of them have broadband. And many in this population are less likely to see the lack of broadband as a disadvantage.